Having failed to capitalize on the predispositions when they are young, we leave adolescents so ill-prepared to deal with their hormonal and other changes that we increase the level of staff support – in practice, we move into control mode. Why have we allowed this to happen? Intelligence is largely innate, as is creativity. As children become older they needed more formal instruction. Learning is dependent on direct instruction and extrinsic rewards. Learning is strictly logical, objective and linear. Real learning is accomplished in formal settings, and is measurable. Learning is dependent on class time, and the technology of paper, pencil and textbooks. These assumptions have been around for a long time and are mostly outdated. As professionals, you seek to modify them. But these assumptions are still made by the greater community and by politicians. I, like many others, tired myself out working to place the new findings about learning within the present system. They don’t just not fit; they collide head on. Not only is the system upside-down, but by failing to recognize the significance of informal learning outside of school, it is inside-out as well. 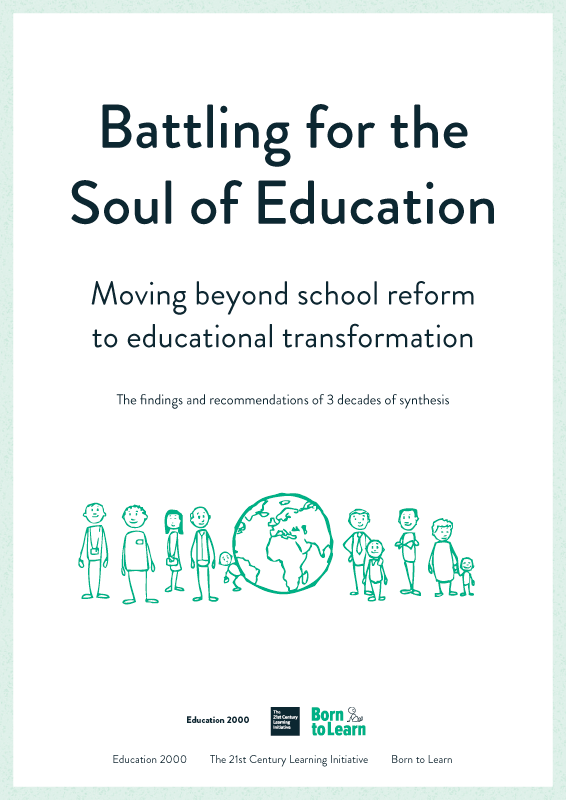 We are on the brink of radical developments in technology so fundamental that they hold the power to alter our education system, our work and our culture. This technological revolution puts learning and conventional education systems on a collision course. The traditional role of education has, for too long been predominantly instructional and teacher-moderated, but the essence of the coming integrated, universal, multimedia, digital network is discovery – the empowerment of the human mind to learn spontaneously, without coercion, both independently and collaboratively. These new technologies are really no longer new. It’s just that we have been so slow to see their real significance. A story illustrates this point. My son Peter had been using a computer at home since he was eight. A few years ago, coming up to high school graduation, his teacher took him to one side and suggested that he stop using the word processor and practice writing out answers right the first time because that was how he would be marked in his exam. He reassured me that he would do fine, but that the exam would not show the best he could do. He added, “Now I know why you do the job you do, but it must be so depressing to see just how slowly things change!” At Cambridge now, he is allowed to word-process essays for tutorials but not finals. They still have to be written in long-hand. Battery Hens or Free Range Chickens? Education is floundering for lack of really clear thinking. By default, we will end up in the world of the battery hens who hardly know how to stand on their own feet when their cages are removed. But those reassuring cages that support us now won’t be around in 20 years time. The survivors will surely be the free-range chickens. I believe we have it within our power to create a very different education system, one in which free-range chickens will flourish. By reallocating resources, investing far more in the education of the youngest children, we could build up pedagogy geared toward the creation of lifelong learners, increasingly accountable for their own learning and skill development.